This detail is taken from a band of script embroidered on linen. The fine quality of the fabric suggests that it could be from a shawl, and the sentiment expressed in the proverb indicates that it was made for a woman. The sentence reads “Love it is that keeps the eloquent man from speech" (Newberry 1940); perhaps it was a gift from a tongue-tied suitor. The stitching is appropriate for what must have been a costly article of clothing as it is fine in scale and carefully worked. In order that the flowing script should stand out in relief, white padding threads were laid and then buttonhole stitches or couching worked over them. 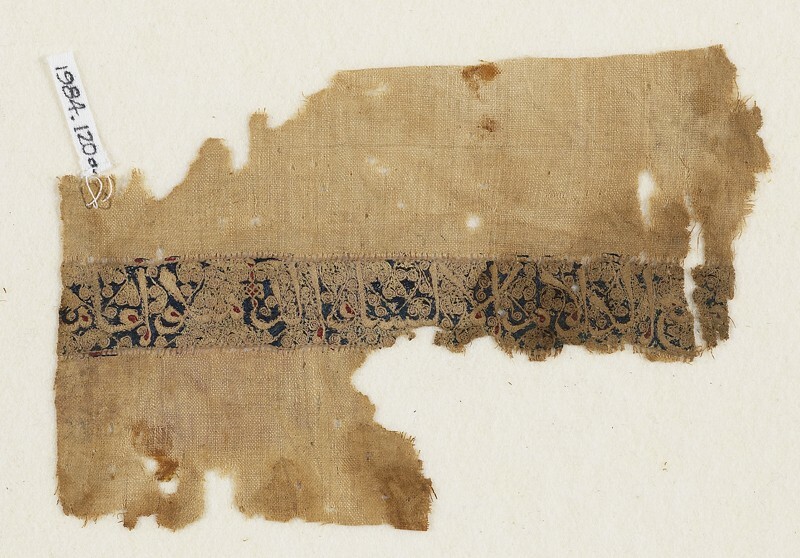 Fortunately, part of a tapestry- woven band of inscription (Acc.No. [EA]1988.22), also worked in undyed linen thread in reserve against a blue background, has survived and provides an interesting comparison between the two. 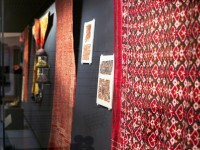 Why embroidery rather than tapestry-woven work came to be the preferred way of decorating light clothing and furnishings is one of the many unanswered questions raised by these fragments unearthed from graves and rubbish heaps. A blue band with a white naskhi inscription against a background of scrolls creating a floral pattern, as well as very fine interlacing with tiny red highlights. The border of the band had a line of open work (drawn thread). The inscription reads: 'It is love that keeps the eloquent mute'. It is the only poetic quotation in the collection; the band was probably part of a sleeve or neck opening. The uncalibrated radiocarbon date is 997 AD +/- 37, but the calibrated result extends the range from 1010 to 1190. A date towards the end of the range is likely on epigraphic and stylistic grounds.